HomeChiang MaiDoi Suthep Temple, the Best Time to Visit. Explore 2 atmosphere of Doi Suthep temple. Day time and Night time and you will have a special chance to listen the monks' chanting at night. Moreover, you must be amazed to see night view of Chiang Mai. Reach Doi Suthep temple. The most famous temple in Chiang Mai. The best time to visit temple in the evening with no crowd. New experience to listen monks' chanting. See beautiful the city's view point of Chiang Mai at night. Drop you off at the hotel. 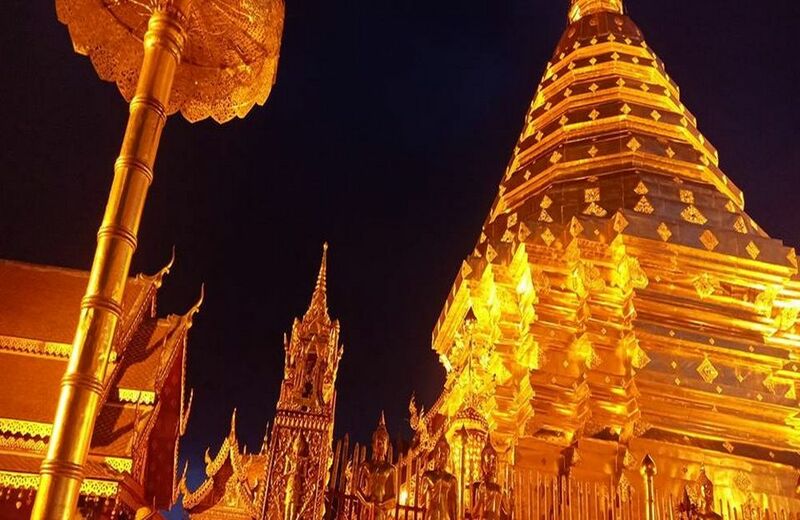 To visit Doi Suthep temple and see Chiang Mai view at day time and night time are very fantastic. The best time to avoid crowd. Scarf to cover shoulder and knee for lady.